Rated 5 out of 5 by LAndersen from Remember to unlock the two "hidden" resorts! The other reviewers have already said it all, and I agree with them wholeheartedly: this is an amazing game in every sense of the word. However, word of warning before you start playing: Remember to use awarded gems to unlock the paths to the two locked resorts. If you don't, the game will end after you've completed the four open resorts, and you'll be left high and dry without any chance to earn new gems. This happened to me and was very frustrating. However, the game is so much fun that I didn't mind too much having to start all over again. Rated 5 out of 5 by MacQueen9 from Hail to the Coconut Queen!!!!! Best Time Management Game Evah!!! What's not to like about this game?! It's storyline is hilarious! The graphics are phenomenal!! It's challenging enough to keep you going without being so difficult that you give up. Witty and corny lines from hunky tropical men like "See these muscles? I grew them myself." and "Yes, your gorgeousness." with many more that will keep you chuckling throughout the game. Hope there will be a Coconut King!!! Rated 5 out of 5 by rantanplan269 from Great Fun! The graphics might be old school, but the gameplay is great. Rated 5 out of 5 by MrsK80 from Hidden Gem - Great Game! I found this game because someone mentioned it in a review of another game. You are actually building resorts in this game, not farming coconuts as the game implies. You can place various types of resort buildings such as cabanas, cottages, condos and hotels, and upgrade them as you see fit. Various decorations also increase values in your resort. 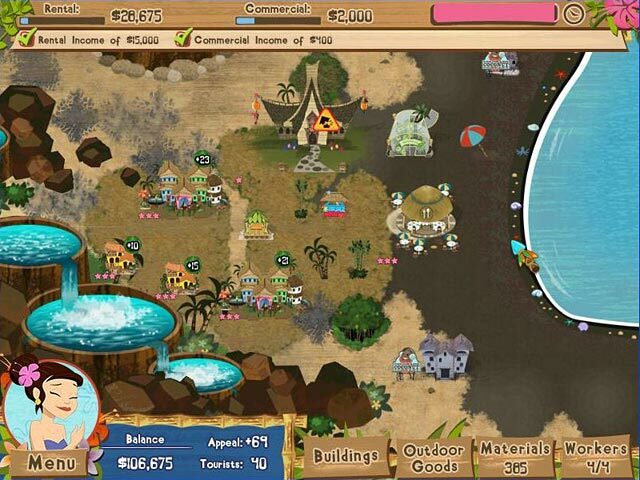 Gems received can purchase things like faster workers and discounts for supplies. There are many ways to win the level and this game has a lot of replay value. If you enjoy games where you can decorate and build to your liking and not in a set position, this one will not disappoint. Rated 5 out of 5 by gemmakitt from A fun little game This is a great Time Management game. It starts off easy but gets harder as you progress, and I have spent a number of hours replaying the levels to beat the clock. There is also a great free play section for a more leisurely pace. The comments are funny although they do get a bit repetitive but nothing that is too bothersome. I haven't played a lot of TM games, but am thoroughly enjoying this one. Great value. Rated 5 out of 5 by MrsLoha from Adorable TM Game! The story line is fun! The Graphics are Great! The music is more than tolerable! and the game has increasing challenge! What mor can you ask for in a TM game? Really, a well thouhgt out, silly game! Truly enjoyable even when a challenge! The comments made by "The Helpers" made/make me laugh! An all around enjoyable game, and I am glad I purchased it! Rated 5 out of 5 by mollyopo from Nuts about Coconuts! A really fun game you'll play more than once. I like games where you can build where you want (like the Westward series). This is just so fun because of the funny things the hunky guys say. Males might not like it as well but girls, this is fun! Rated 5 out of 5 by merlinsgirl from Very fun and re-playable game! This game is great, funny and well done. It is one you can play over and over again and also features free play where you can create the "resorts" any way you please. Certainly not the most challenging game out there but the fun factor way makes up for that. Rated 5 out of 5 by EnvirEng from So Funny My Sides Hurt You know, from a game playing perspective, I would give this a Four--Very Good. As for overall enjoyment, this is definitely a Five. Graphics are ok. Music is good and voice overs (Zane) are fantastic. "As you wish, your Majesty." Sort of a city building game. Maybe more time management without the timer? Hard to decide. Plenty of replay potential. The story is irrelevent, but here it is. You work for Cococo (Coconut Company) and are sent to the island to build resorts. There are several beaches that need to be developed. Upon arriving, a big, muscular, dreamy man shows up and tells you that you are now the Queen. Zane provides constant, hysterical, commentary. "Do you like my buns? I baked them myself." "As you command, your Majesty. I can sleep later." So, you clear land, buy supplies, hire brawny workers to build things for you. No pressure, just fun. Each area has its challenges (earthquakes, dangerous butterflies, angry spirits--monkies). When you complete certain goals, you are rewared with gems that you can trade for different things: additional decorative items, faster delivery times, paths to other beaches, etc. As you build cabanas, hotels, etc., tourists show up and wander around. They are funny, too. Remember, butterflies can be dangerous, but sharks just need to be 'shooed' away. Once you adequately develop each area, you can go back in free play mode and try again. Complete enough work in free play mode and additional buildings become available. Can't wait for the sequel. Maybe we will find out how we became Queen. This is just a wonderful game. Play it and see. Rated 5 out of 5 by SilverBranch from Fun, funny and relaxing There's not much more that can be said about this game that's already mentioned above. I just wanted to add my 5 star rating to this highly enjoyable game. I'm guessing women would definitely like it more than men because of all the "hunks" pandering to your every need. The things they say just crack me up! The game play is personalized - place things wherever you want. But the nice thing is, placement is not arbitrary. You can plan where amenities will go to help your rentals. The music was so relaxing that I want the soundtrack for background when I paint. I was sad when the game was over. Not sure if the sequel will be filled with subservient women voice overs, which I won't like as much at all, but I'm sure it'll be a fun game. Rated 5 out of 5 by merivilan from Totally love it It is wonderful to place things where you like. I love being called "your gorgousness" Something I do not get enough in real life. Nor do i get hunky men running off to do my bidding in reality. I will be playing this for a long time. Best game for ages. Rated 5 out of 5 by kathiebee from Show me the way --- --- to this island! What a fantastic place for a girl to be! And what an absolutely great, fun game! I agree that it has to be about the top TM game ever. I am so glad that BF had it on the daily deal, because I missed it before then. Worth it by far, even at full price. I love the fact that you can place buildings where you want, and I love the plant and other outdoor upgrades too. Not just buildings as in other TM games. The hunks that do your bidding are funny and gorgeous. I don't know if guys will be too taken with this game --- except if they want to pretend to be one of the HUNKS! Totally and completely recommend this game. Rated 5 out of 5 by caj_gamer from Cute and Fun Time Management and Strategy Game This was one of my first games that I ever played on BFG and got me hooked to BFG. I ended up playing this game 3 times in trying out different strategies with building different structures in different locations trying to maximize earnings while making sure all of the objectives are met. The storyline is cute and as a female player, it was great seeing all of these hunky islanders answering to the Coconut Queen's beck and call to build and take care of the island (even wrestle sharks!). How hot is that! I also enjoyed the storyline of starting in the island resort business and the cute humorous references to Fantasy Island. The graphics and music are just okay in my opinion, but I'm also comparing to games that I've played that hav incredible 3-D graphics and actual bands who do the music. Overall the game's a keeper and will probably be played again sometime later. Enjoy! Rated 5 out of 5 by sclevenger18 from Love this game! I too love this game. It is fun to play and the characters are hilarious. I just want to know when the sequel will be out?! Rated 5 out of 5 by feger40 from i liked this kind of game thay are fun to play i even like to play its a great game to play so is hide and object games i like to play them to. they are so fun to do my daughter and son like to play them to they play it with me. we have fun doing them. Rated 5 out of 5 by fairycharmed from Silly funny WONDERFUL game This is a very silly TM game. I absolutely adore playing because of the voices and just...the general sillyness of the game. 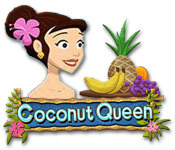 You play as the "coconut Queen" and have multiple handsome minions obeying your every wish. Trashy Romance novel cover parodies Big Brawny and Deep Voiced, the voice overs are cute, slightly snarky and OH so much fun. It truly makes the game more enjoyable. The game itself is mildly challenging and a nice twist is that because you're "building" an island resort, levels are done in the same area. So something you built once, is there in the next level. A definite plus. 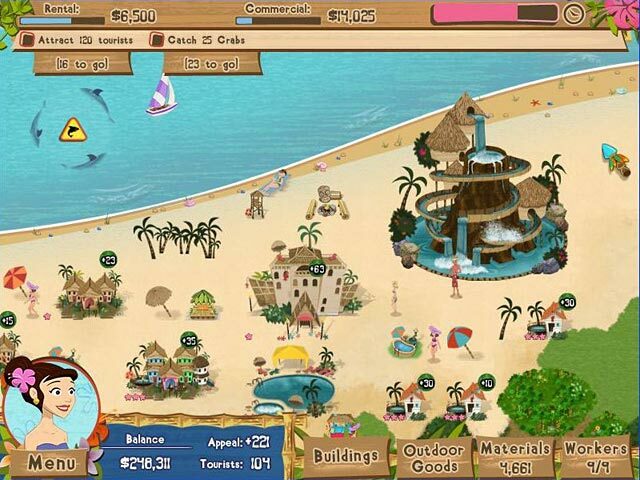 Try Coconut Queen for the zanyness and stay for the cute graphics and the gameplay. I promise you won't be disappointed! Rated 5 out of 5 by CirceMoon from A Wonderful Strategy/TM/Building Game Coconut Queen is, hands down, my favorite game on BFG. It is the only building simulation of which I'm aware where you have total control over where and what you build. In addition, it blends in simulation, a great deal of strategy, and time management gameplay, all of which makes for a unique and fun gaming experience. The only game that is remotely similar is the Paradise Beach series, although Coconut Queen is far superior, in my opinion. 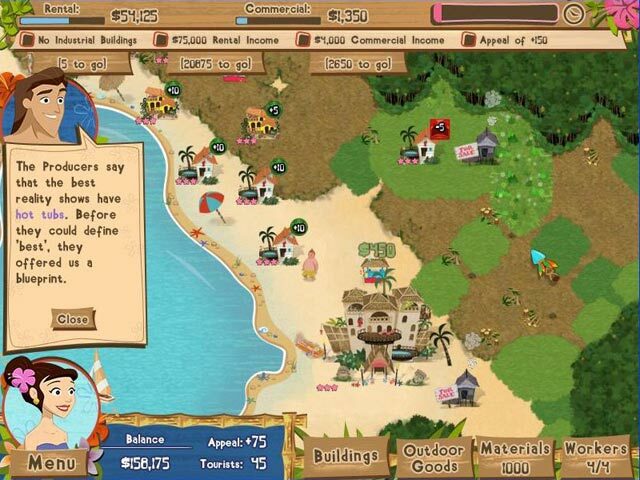 You are playing as a woman who has been hired to turn a series of islands into resorts. On each level, you are given goals to meet, generally having to do with earning a certain amount of money from rent and concessions and having a certain number of guests. The levels are timed, although the timer is pretty generous. There are a variety of different types of houses to build and upgrade, from simple cabanas to huge hotels. There are also tons of other types of buildings from which to choose, including restaurants, shops, tourist centers, and more. As with other building games, you also have to manage happiness by providing attractions such as umbrellas and hot tubs and minimizing undesirable features. You are free to build your resort and design it in any way that you'd like, which is a great deal of fun. If all of these options sound complicated, don't worry, because the controls are nearly flawless and everything flows organically. There is a great deal of humor blended into the game, which adds to the fun. Your work is performed by hunky natives who have made you their queen. If you leave the sound on, you are likely to get a laugh out of the things they say as they are assigned to a task. This game has great replay value, because you can redesign your islands each time you play and figure out different strategies to meet your goals. I have played this at least six times, and will happily play it even more. The bottom line: Don't pass by this game, as it's a winner for anyone who enjoys time management, building, and strategy games, and for anyone who just enjoys having fun! Rated 5 out of 5 by adolia from Best Game on BigFish! This is by far my favorite game on Big Fish. It is a true building game, where you choose the placement of the buildings. I have replayed this game from start to finish at least a dozen times, each time using a different layout or strategy. The goals are challenging but not too difficult.